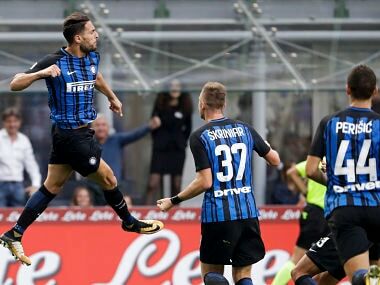 Milan: Danilo D'Ambrosio scored late as Inter Milan squeezed past Genoa 1-0 in Serie A action on Sunday to keep in touch with the leaders, as AC Milan fell 2-0 at Sampdoria. D'Ambrosio headed in off a corner with two minutes to go at the San Siro to earn three points for Luciano Spalletti's side, who saw their winning run end on Tuesday with a last-gasp 1-1 draw at Bologna. Adel Taarabt and Stephane Omeonga were sent off for Genoa in injury time as the club from Liguria remain winless in their opening six games. Inter stay third, two points behind leaders Juventus and Napoli, who both claimed their sixth win out of six on Saturday against Torino, 4-0, and SPAL, 3-2, respectively. "It was a tough match, but we stayed solid," said Spalletti. "We must create this winning mentality that makes us believe that we can beat anyone. "There is a gap with Napoli and Juventus, but that's to be expected, considering where we're coming from. It's tough to recreate a winning mentality after a poor campaign. There is always that fear of reality setting in. 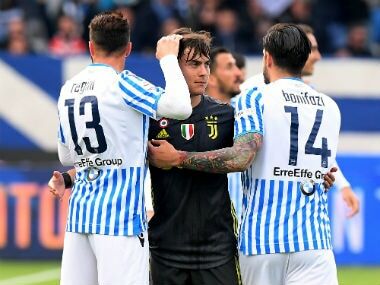 "Napoli and Juventus have that mentality, so do Roma and Lazio. We also mustn't underestimate Sampdoria and Torino, who are two strong sides." Ciro Immobile scored a double including one from the spot to bring his tally to eight for the Serie A season, as injury-hit Lazio stayed fourth with a comfortable 3-0 win at Verona. 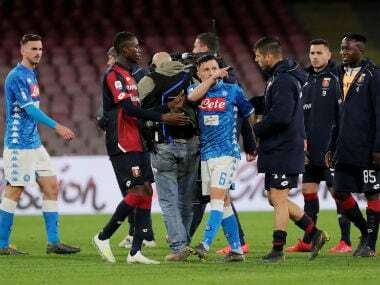 Lazio coach Simone Inzaghi was delighted that his side knew how to respond positively to their 4-1 defeat midweek to Napoli. "On Wednesday we had a setback that we didn't foresee, even though we were playing Napoli," said Inzaghi. "One goal would have allowed Verona back into it at home, but we never risked it. "There are no more adjectives for him (Immobile). 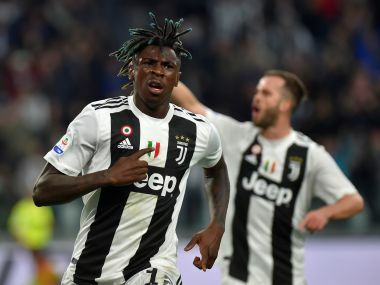 He gives a lot and (Italy coach Giampiero) Ventura will definitely be counting on him." City rivals Roma, who have a game in hand, are fifth, after easing past Udinese 3-1 on Saturday. Zapata broke through after a terrible clearance by his cousin and fellow Colombia international Cristian Zapata on 72 minutes with substitute Alvarez getting the second just before the final whistle. Chinese-owned Milan, who spent almost €200 million in the summer, remain sixth after six games with Sampdoria, who have a game in hand, moving to seventh, just a point behind. "We have to find out why some things didn't work, I saw too much of a below par performance," said Milan coach Vincenzo Montella. "We were insufficient both in determination and quality. We were psychologically running on empty. Perhaps for some the third game in seven days was a problem, but we need to analyse the situation." Milan defenders Cristian Zapata, Leonardo Bonucci and Alessio Romagnoli struggled to contain the Genoese. Sampdoria had been awarded an early penalty, but the handball decision was overturned by the video referee. Atalanta snatched a late 1-1 draw at Fiorentina to move up to ninth after Remo Freuler's goal four minutes into injury time cancelled out Federico Chiesa's superb 12th-minute opener. Substitute Orji Okwonkwo scored a minute from time to give Bologna maximum points at neighbouring Sassuolo who had captain Francesco Magnanelli sent off for two late bookable offences. Chievo won at 10-man Cagliari thanks to Roberto Inglese and Mariusz Stepinski's second-half goals as Crotone earned their first win 2-0 over tailenders Benevento.